As a rule, in phones whose operating system is Android, the weak point is often the system memory of this device. Moreover, there are devices on which the increase in this memory cannot be done in any way, and this is very unpleasant news for the owners of such devices. It is due to the large accumulation of various types of files and applications on a smartphone or tablet that the device begins to load for a long time and slowly perform its immediate work.. The situation is certainly not the best, but even from it there is quite a logical way out. It is in this article we consider, due to what you can clear the memory and free up as much space as possible. If you need to clean the system memory on the phone from unwanted garbage, then you are reading the article you need. In the market for the production of such devices, there are companies that produce devices with built-in system memory and direct modules. There are quite simple devices on which you can simply format the memory and you will be completely happy. To carry out this method can be even easier. You can use the so-called card reader and connect the memory card and the device itself to the computer, where the implementation of cleaning the phone from unwanted debris will occur. Well, later in the article we will look at other methods that are more complex ways to clean up memory. Clear system memory through a conductor - one of the most common ways that generally exist today. This conductor is located on the most direct device. You need to understand that Android is not a simple operating system, and therefore the implementation of many operations on such devices will be extremely difficult, especially if the memory is full. But this method is relatively simple. You need to go to the utility on your Android, and at the very top find the icon that shows a pencil. After you just need to click on it. Next, a list of programs will be provided to your attention, and from them you should select those that you directly want to remove. After you choose, you should look at the bottom of the screen and find there a button with a picture of a basket and click on it. 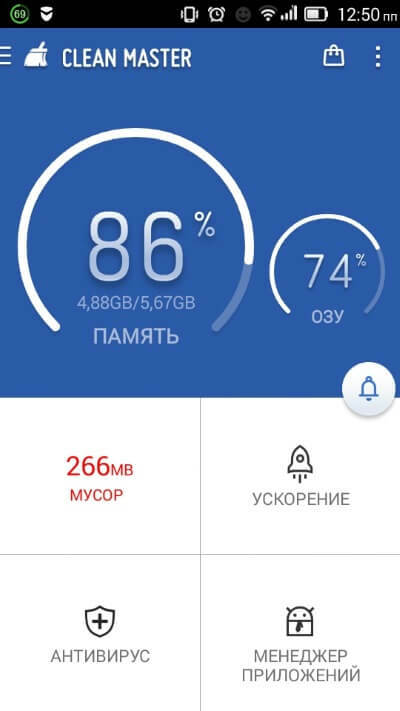 Also, in order to clear the memory on your Android, you can use the program that is present on your device. This program has a name. Clean Master. In this case, all your work will be associated with the so-called utility, working with it is very simple. And you remove all the applications that you do not need. Clear the memory on Android Quite simply, the main thing is to carefully remove any unnecessary applications. Today I have everything, you can share this material on social networks.